Dagaz – Day – Huzzah! Our hard work has culminated in completion. Not only have we completed the task we’ve labored over for so long, we became one with it. We attained its wisdom and made it our own. We’ve come through external strife and layers of ourselves to arrive at what we have most sought, definitely most needed. We have reached the pinnacle of awareness. We are sitting in the moment of power, so… now what? That’s pretty much how I refer to Dagaz–“So, now what?” While its meaning is ‘day,’ or ‘daylight,’ it calls us to pay attention to the stellar hallmarks we use to indicate the progression of a day, the most essential opposites of the Natural world: twilight to dawn, likewise, sunrise to sunset. How often do we observe one giving over to the other, not the state of light shifting to darkness, or the dark becoming illuminated, but the point at which they are one and the same? When is the last time we sat at the heart of such extremes and realized the profound magick of doing so, while doing it? And what came a split second after transition to the next phase? Most of us realize what we go through to get through a day, everyday. We can rattle it off like a pledge of allegiance: We rise, we work, we love, we sleep, we get up, then do it all over again. For the most part we can assume that the close of one day brings another. From such routine and faith, the question then arises, what makes one day unique from any other? The same thing that makes anything unique from all other things: awareness. What we hold in mind has power. At the end of our awareness is our strongest point of power, and this is the magick of Dagaz. 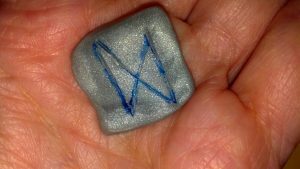 A Rune of oppositions, Dagaz challenges us to hold extremes not in tandem, but all at once. We are this and that. We are here and there. We are the rock and the hard place. We are the enlightened and enlightenment. In Dagaz, the objective of our effort has manifest. We’ve reached the mountain top, and are left to what? Chart the course again. The wisdom of Dagaz is in the heart of that mystical moment where polarities meet, clash, surrender to each other. The outcome of it lies in realizing we’ve done this process before, we’ll do it again, a promise of good things coming to those who wake.